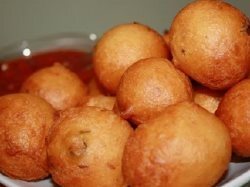 Bonda is a typical South Indian snack. 1. Boil potatoes with turmeric, and salt. 2. Peel skin and mash the potatoes and keep them aside. 3. 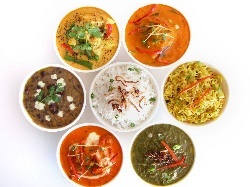 Fry in little oil, mustard, uraddhall, channa dhall, cashew, green chilles, curry leaves and ginger. Mix this well with the mashed potatoes, and add fresh lemon juice. 4. Roll small balls and keep them aside. 5. Make a batter with channa flour and little salt. 6. Coat the balls in this batter, and deep fry in oil. 7. Enjoy your Potato Bhonda. Hits: 421, Rating : ( 3.6 ) by 7 User(s).